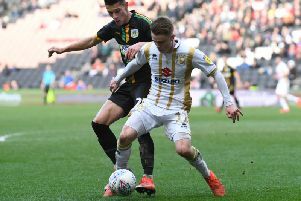 Alex Gilbey admitted MK Dons have not been good enough for several weeks after they suffered their fourth defeat in six games on Saturday as they went down 1-0 to Crewe. Dons are now down to fifth in League 2 after Charles Kirk netted the only goal of the game on 32 minutes for the Railwaymen, who picked up their first ever win at Stadium MK. Defeats to Colchester, Cheltenham and Bury have made for a miserable run for Dons, one which Gilbey admits is not good enough for a promotion battling side. "It's really disappointing – we weren't good enough today and we haven't been for a few weeks now," said the midfielder. "We had a good win against Cambridge but we haven't been ourselves. We really have to buck our ideas up and get back on track. "It's easy to be confident and play without any worries when you're winning. But when it's back against the wall, we all have to stand up. We've now got a big test at Grimsby on Saturday, and we really need to put things right if we want to be successful and get back to winning games. "We can't get too carried away or get too downbeat. It was a nearly game today – we nearly scored, nearly got on the end of things. On another day, they go in and it's a different story. Now we have to stay on it, get a win and get back up the league. "It's a big week coming up. It's swings and roundabouts in football. We've got to be positive, worry about Grimsby and get back on track."